Let’s get one thing straight right off the bat. I know this isn’t real cannoli. At least not the phyllo shell part. But if your looking for an easy–and very tasty–alternative, these Chocolate Chip Cannoli Bites are for you. 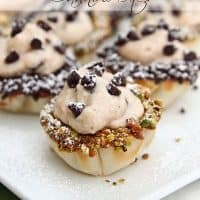 Not to mention, these bite-size cannoli cups are a perfect, not-too-messy way to serve this classic Italian pastry at your next party or get together. But don’t wait until then to try them, because the filling is fabulous! I had more than a few spoonfuls while preparing the recipe. If you’re in a real hurry, you could skip dipping the shells in chocolate and nuts, but it really does add a fun, cannoli-like touch. 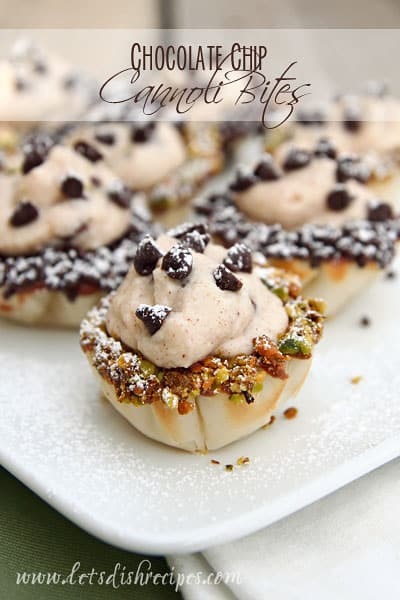 If you’re a cannoli purist and want to make something similar with a real cannoli cookie base, check out these cannoli bites over at Cooking Classy. In a medium bowl, whisk the ricotta until smooth. Sift in the powdered sugar, cinnamon and allspice and stir until well combined. In a separate bowl, beat the heavy cream until stiff peaks form. Fold the whipped cream into the ricotta mixture. Stir in the chocolate chips and lemon zest. Refrigerate for 30-60 minutes. Meanwhile, melt 1 cup chocolate chips in a double boiler or in the microwave (about 2 minutes at 50% power). Dip the top edge of the mini phyllo shells in the melted chocolate, then in the chopped pistachios. Allow the chocolate to set. Fill a pastry bag (or zip-top bag with the corner snipped off) with the cannoli filling. Pipe the filling into the prepared shells. Top with additional mini chocolate chips, if desired, and dust with powdered sugar. Who Dished it Up First: Cannoli filling adapted from Food Network. I’m in love with these! Pinning them for my next party! Yum! The addition of the lemon zest sounds so good.